As a conductor, Julian has performed staged opera productions for organisations such as the Buxton Festival, Dutch National Opera Academy, Grimeborn Festival, Guildhall School of Music & Drama, New Chamber Opera and New Kent Opera, and concert performances with, among others, the Bampton Classical Players, Barts Chamber Choir, Bury Court Opera, New London Singers, Rodolfus Choir and Spiritato. He has acted as a conductor and Baroque coach for some fifteen projects with the Southbank Sinfonia, in which modern string players learn to perform earlier music with Baroque bows, and coaches students as a visiting teacher at the Royal Academy of Music and Royal Northern College of Music. He is currently devising a pasticcio about Casanova for Kings Place with Sounds Baroque, and will be returning to the Anghiari Festival this summer to conduct the Southbank Sinfonia. As a player, Julian has appeared with many leading soloists at venues such as the Wigmore Hall, London, Lincoln Center, New York, and Sydney Opera House, as well as at the BBC Proms and Edinburgh International Festival. In addition to performing in productions at The Royal Opera House, Covent Garden and Welsh National Opera, Julian has appeared as a soloist and continuo player in repertoire ranging from Monteverdi to Dove with many leading groups including the Academy of Ancient Music, Britten Sinfonia, Classical Opera, English Concert, Gabrieli Consort & Players, Orchestra of the Age of Enlightenment, Orchestra of The Sixteen, Royal Northern Sinfonia and Scottish Chamber Orchestra. He is also an advocate for the clavichord, and is the first musician to have given clavichord recitals for international festivals at St Albans, Buxton, Canterbury, Colchester and Two Moors in repertoire including J. S. Bach’s 48 Preludes and Fugues. 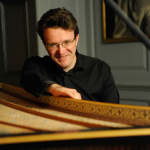 His discography includes solo and chamber recordings for Avie, Coro, Chandos, Opus Arte and Resonus on a wide range of instruments, including the Queen’s harpsichord at Kew Palace. He has made world première recordings directing Daniel Purcell’s opera-oratorio The Judgement of Paris, playing harpsichord suites by James Nares and John Christopher Smith, and Stephen Dodgson’s clavichord suites. Julian read music at King’s College, Cambridge, and completed his formal studies at the Schola Cantorum, Basle and the Royal Academy of Music, London. Singing is central to Julian’s approach to music; the prestigious Baylis programme at English National Opera and tours with the Monteverdi Choir were formative experiences. His mentors have included Noelle Barker, David Parry and Trevor Pinnock. He is a Fellow of the Royal College of Organists, and has been elected an Associate of the Royal Academy of Music in recognition of his contribution thus far to the music profession.